Sarah is well-traveled in Kenya - born in Kakamega, schooled in Mombasa, and now living on the outskirts of Nairobi in Ngong. She went to the Star of the Sea School as a youngster where she first discovered her interest in the arts - she was only 8 years old at the time. She continued her education at the School and Mukuma Girls School in Mombasa, graduating in 1986. She graduated university in 1988 with a BA in Design. Afterwards she began practicing on her own and also taught at the Kenya Institute of Mass Communications. 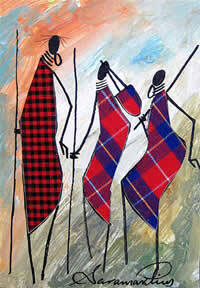 In 1995 she began working at the Kenya Broadcasting Company (KBC), where she met fellow artist Bulinya. She jokes that she is a Luhya living with the Maasai in Ngong, and attributes the beautiful landscape of Ngong, and the Maasai that pass through her area, as her main creative influences these days. One of the most exciting aspects of Sarah's paintings is the incorporation of feathers and fabrics into her paintings. These paintings are lovely and because of the media mix, really have a nice natural depth and texture.